by Nicole Gulotta for Thrive Market We do lots of things to care for our bodies, like getting enough sleep, slathering on sunscreen, and squeezing in an exercise class. But what about our brains? 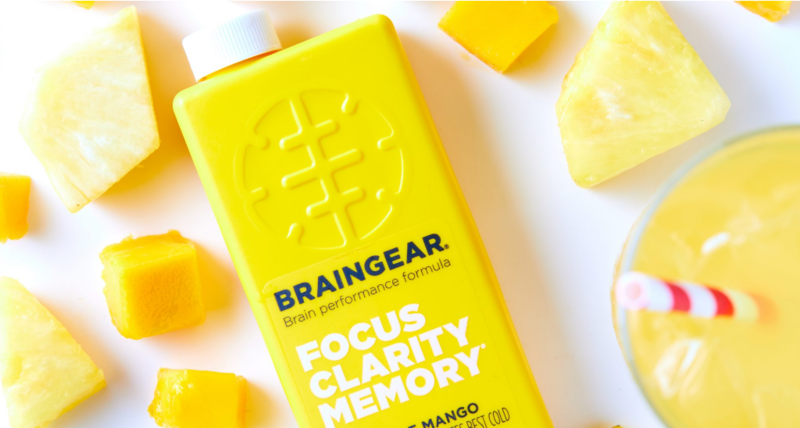 Our hectic lives keep this essential organ running on overdrive, but BrainGear has entered the brain health scene with something new—a potent mix of ingredients it claims is designed to nourish our neurons. BrainGear has some serious street cred thanks to a team of top neurologists from Stanford University, University of Texas, Austin, and Boston University who created the formula, and each nutrient was expertly chosen to help support brain function and performance. Here’s a closer look at what’s inside: The ultimate brain blend Each bottle of BrainGear’s Brain Performance Formula delivers 1,845 mg of 13 active ingredients like Acetyl L-Carnitine and N-Acetyl L-Tyrosine (amino acids), DMAE (a substance produced in small amounts by the brain and common in anchovies and sardines), and PQQ (a natural compound found in foods like parsley and green peppers). There’s also a dose of vitamins like D3 and B12. Fits into your schedule BrainGear can easily be stirred into juice, smoothies, or water. It comes in a delicious pineapple-mango flavor that’s non-GMO, soy-free, and gluten-free, with 3 grams of sugar and 10 calories per serving. Because BrainGear isn’t caffeine-based, it’s great for anyone with sensitivities to coffee or other stimulants. (The amount of caffeine inside each package is equivalent to about half a cup of green tea). It’s a no-brainer When taken on an empty stomach, you’ll likely feel the effects within 20 to 30 minutes, and for up to 8 hours. In the short-term, BrainGear suggests it encourages greater focus, clarity, and concentration, and some have described the sensation as being “in the zone.” Over the long-term, BrainGear believes taking better care of your brain may result in better memory, mood stability, and more restful sleep. Take it as a single dose when you need to be very focused, or make it an everyday habit. So the next time you do something good for your body, don’t forget about your brain! Start nourishing it from the inside out, and you’ll be ready for whatever life throws at you.